5/8/77 – Grateful Dead’s most talked about and traded show from Barton Hall at Cornell University, has been mastered from the Betty Board tapes and commercially released along with other May 1977 Dead shows. The hype, excitement, and anticipation over this release since its announcement earlier this year has been turned over into just as much appreciation for the release in its various formats. Monday, May 8 2017 marked the 40th anniversary of the legendary Cornell Barton Hall show and in Tompkins County it was declared as “Grateful Dead Day” by way of proclamation. It was a particularly special day for the Big Red Deadheads out there with a special tribute concert by the Cornell Chimes, performing a handful of arrangements of Dead tunes. Rhino Entertainment, the Grateful Dead’s record label, hosted two special events with one at the State Theatre featuring Terrapin Flyer and a second at the Capitol Theatre where the newly released 5/8/77 show debuted in full concert sound for a rather fun listening party. The Grateful Dead’s Barton Hall show gained notoriety in part from the fairly quick circulation of the soundboard recording of the show among traders, which itself is of good quality with some minor flaws. In comparison, the new official release is immaculate and among the best of quality mastered commercial Grateful Dead releases. Although there was no band on stage at the Capitol Theatre, hearing the freshly realesed 5/8/77 show through the Cap’s PA system in full concert sound captured the essence of being at a live show – so much so that folks were dancing around the floor. 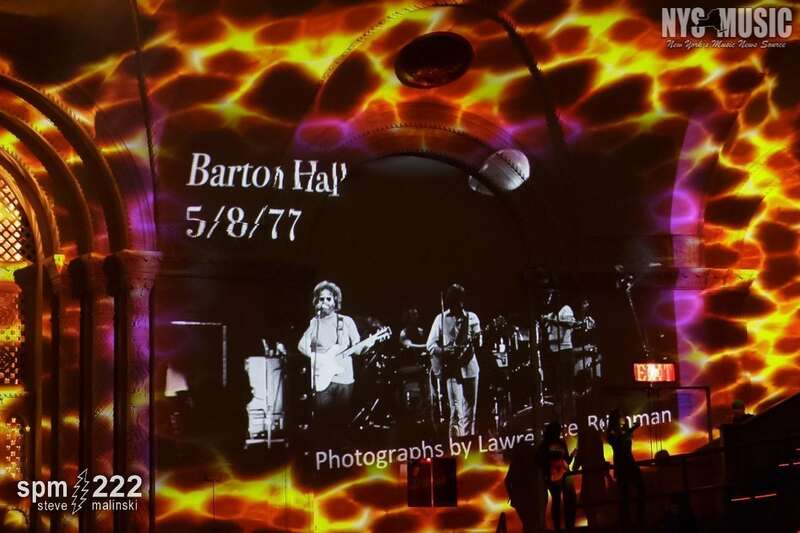 While revisiting 5/8/77 at the Cap reminiscers were treated to a montage of photos from the show itself, many unseen before, projected on the theatre walls. 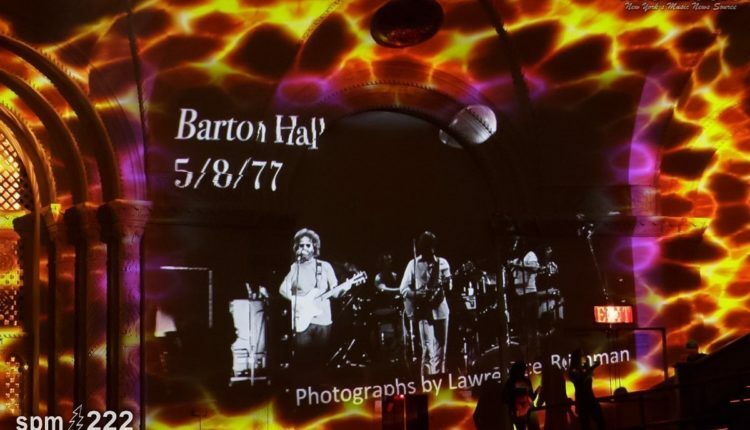 Those photos were taken by then Cornell freshman Larry Reichman who is working on releasing a complete book featuring many more images from Barton Hall that day from setup through the concert. He was there at the Cap to promote it (the black and white photos shown within the photos in this article are by Reichman). 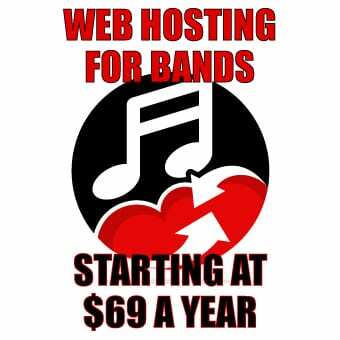 He is currently running a Kickstarter campaign which ends on May 24 and can be found here. NYS Music caught up with Reichman at the Cap to chat about the book and his Barton Hall experience in an interview that was also broadcast on WVBR-FM in Ithaca. Steve Malinski: Can you tell us about your background in photography? Larry Reichman: I got into black and white photography when I was a high school student down in New York and learned to develop negatives and prints the old fashioned way and when I got to Cornell, I started working for a newspaper and started taking photos of events on campus – most of the concerts they had on campus that year – and jumping ahead to this show I had gotten a pass from the Cornell Concert Commission to be in [Barton Hall] the whole day. So, I took photos of the setup and the whole show. SM: What prompted you to shoot the Barton Hall show? LR: Well, I was a big Dead fan so there was no way that I would not go to the show. I had a press pass for most of the shows that year and I could have done that, but a friend of mine was a volunteer for the Cornell Concert commission and suggested I talk to someone there. While I had no special arrangement with the Concert Commission, I gave them a few photos of the show which are also now part of the Cornell University Archives. SM: Can you take us through the course of your day at the Barton Hall show, and interesting things that you saw? LR: I didn’t really know what to expect. So I was just in the Hall and as you know, it’s a big empty hall. Not a barn, but a big open space. They had to literally build the stage and lighting. There were these super trooper spotlights going in. As things were loaded in I was just wandering around taking photos. Probably the most memorable moment was (since I had a lot of time to kill earlier in the day) while I was wandering around behind the stage I looked up and the band was about four feet above me on stage. Because I was kind of shy I didn’t say hi to the band but nodded to Jerry and was on my way. The show of course was memorable. I got to claim a spot right in front of the stage and shoot from there. SM: And you were only a freshman at Cornell doing all this? LR: I was, 18 years old. I had seen them a few times before that and it was awesome to hear that they were coming to Cornell and I didn’t have to go far to see them. SM: You’re working on a new photo book with many never before seen photos of the Barton Hall show, which you are raising funds for through Kickstarter. Can you tell us about the book? LR: Again, I was there the whole day for setup, soundcheck and the whole show. So what I’m putting together is a really good quality book, about 80-pages long. My goal is to have something special, a really good quality coffee table kind of book printed in the US. There will be three chapters. First chapter is the setup, and in fact the announcer of that show, Bob, is here tonight and I happen to have a photo of him in the book. Then the next chapters will be First Set and Second Set. First set, for the photo buffs out there, I shot with a 50mm lens, so it’s a bit more of a wide angle. For the second set I had a telephoto lens which allowed me to zoom in a bit more. Because of slower shutter speeds and other technical parameters it allowed me to capture some movement on stage. The book will have a variety of shots and won’t just be picture after picture. It will be an artistic layout. SM: And you’re running a Kickstarter to get this going? LR: Yes, the book is laid out and ready to go but I need help to print it. So I’m running a Kickstarter to raise the money for the printing. People can pledge to support it with various rewards, including a pre-order of the book and individual photos from the show. Editors note: as of the publication of this article, the Kickstarter campaign has been fully funded. SM: You mentioned that you were also involved with WVBR back around that time as well? LR: Yeah, I signed up to volunteer there my first week at Cornell back in 1976. I was just really interested in all things music. I learned how to splice tape and make commercials. I had a show on the AM band which was literally broadcast through the AC electric system on the West Campus of Cornell. I’d go there on Saturday nights and spin records, played a lot of Dead. Then the next year I did a bit of engineering, particularly for the news shows. Also, the newspaper I was working for was downstairs in the building. I don’t recall the name but it was a weekly startup. I think that’s how I learned about the paper from going to WVBR and saw the paper downstairs. I decided to check it out and that’s where I developed all of these photos. It was all off-campus in Collegetown.